Key countries in the International Monetary Fund (IMF) have pledged to pursue "growth-friendly" policies to kickstart the slowing world economy. The IMF's steering committee, made up of 25 of the world's largest economies, said the global outlook was fraught because of weak trade and a series of risks including a UK exit from the EU. It urged countries to boost public spending and avoid deflation. The IMF last week made its second cut to global growth forecasts this year. Christine Lagarde, managing director of the IMF, described the talks between finance ministers and central bankers in Washington DC as "collective therapy" to deal with the gloomy prospects. 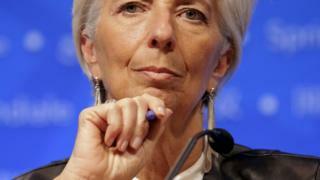 But she said calmer financial markets since February had reduced the nerves at the IMF spring meeting. "There was not exactly the same level of anxiety but I think there was an equal level of concern, and a collective endeavour to identify the solution and the responses to the global economic situation," she said. The IMF now predicts global growth of 3.2% this year and 3.5% in 2017, having previously forecast 3.4% and 3.6% respectively. "Downside risks to the global economic outlook have increased since October, raising the possibility of a more generalised slowdown and a sudden pull-back of capital flows," the IMF steering committee said. It said countries' tax policies and public spending should be "as growth-friendly as possible". But it also pledged to "refrain from all forms of protectionism and competitive devaluations", amid concerns that some countries are keeping their currencies weak to boost exports.